The footage shows a precise hit of U.S. Air Force on the Syrian military and units of the Russian PMC Wagner near Deir ez Zor. 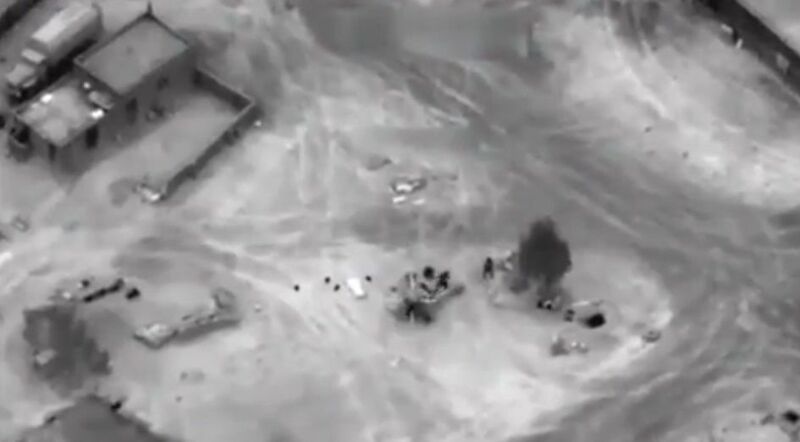 A video was released of the U.S. deadly airstrike on Syrian forces and units of the notorious Russian private military company Wagner near Deir ez Zor in Syria. The strike first destroys a T-72 main battle tank, then hitting an artillery gun and liveforce, according to a Directorate 4 Telegram channel. Read alsoU.S. reportedly kills more than 100 Russian, Syrian-backed fighters in 3-hour military blitzIn the left corner, a Russian Ural truck is also seen. As reported earlier, on Feb 7 as a result of an air strike of a U.S.-led international coalition over 100 fighters of pro-government forces were killed. It later became known that mercenaries of the Russian PMC Wagner were terminated in the strike. Read alsoSBU releases intercepted comms between PMC Wagner chief, Russian army General on Donbas incursionFurther reports claimed some 200 mercenaries were killed.